Bovid is the family which comprises 140 species scattered over all the continents. It includes bison, antelopes, gazelles, buffaloes and cattle among many others. They are herbivores, mostly grazing to satisfy their feeding needs. Some wild species, once intensively hunted, have become domesticated and are no longer threatened with extinction. 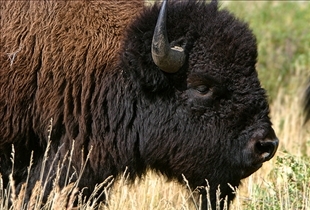 Buffaloes and bison are social animals that live in herds, usually near a source of water. The hierarchy within a group is composed of a basic herd of females and calves protected by a herd of young bachelor males and dominant male and females. Herds will always try to protect its members when confronted with predator attacks. The bison can be found on North American and European prairies. It lives in domesticated herds at farms spread across the country, but also in national parks as part of the wildlife populations. Herds of wild bison formerly had a widespread habitat when hunting was a controlled process. But in the 19th and 20th centuries it became an extensive practice which diminished their numbers. Buffaloes live in Africa – the African buffalo species, Southern Asia, South America, southern Europe and northern Africa – the domesticated Water Buffalo and the wild Water Buffalo species - and in northern Australia - feral Buffalo species. Wetlands and swamps are the most sought after places by water buffaloes, while the African buffalo also populates floodplains, grasslands and open forests on mountains in Africa. The American bison can reach a height of 2 meters (6.5 feet). Its body can be up to 3 meters (10 feet) long. The weight of the bison is between 410 to 1000 kg (900-2,204 pounds). The European bison called wisent is bigger than the American species having 2.2 meters (7 feet) in height. Its weight is of up to 920 kg (2,000 pounds). The African buffalo of a height ranging up to 1.7 meters (5.5 feet) can weigh between 500 and 900 kg (1,100-2,000 pounds). The domestic water buffalo can be 2 meters (6.5 feet) tall, while the wild water buffalo is 3 meters (10 feet) tall. Weight ranges from up to 900 kg (2,000 pounds) for the first species to 1200 kg (2,650 pounds) for the second species. The bison has curved short horns. Both females and males display this feature. They are used mostly by males when fighting each other over rank in the herd or to protect the herd from predators. The African buffalo has short and curved horns framing its head, while the water buffalo has long and curled horns oriented to the back. Bison inhabits the North American and European prairies. 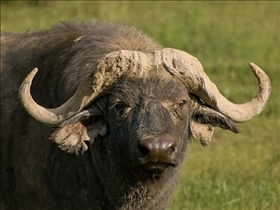 The African buffalo lives in floodplains and grasslands, while the water buffalo - both domesticated and wild species – populate wetlands and swamps. The wild water buffalo is the tallest having 3 meters and weighs the most – 1200 kg. The bison and the African buffalo have short curved horns, while the water buffalo has long and curled horns. Which one is native to the U.S.?